Regional draws have always been part of the lifeblood of boxing. Done right, a fighter can be a franchise. In some towns, it can be the sort of franchise that is the biggest thing in town. Jose Ramirez is getting there right now in Fresno. Terence Crawford has pulled it off in Omaha. At 34, and coming off more than a year-long layoff, the closest thing to a franchise player in the Washington, DC area over the last decade and change is back home. 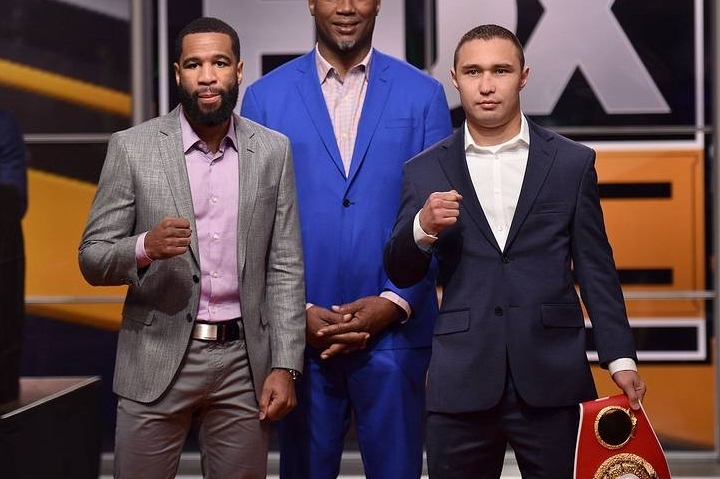 Sunday night, DC-born former Jr. welterweight titlist Lamont Peterson (35-4-1, 17 KO) makes his first start at the MGM Grand National Harbor against 29-year old former titlist Sergey Lipinets (14-1, 10 KO) of Russia. Fittingly, younger brother Anthony Peterson will be a part of the show. It started as a bother act before Lamont established as the bigger star but they’ve shared many a card together. Sure, the Peterson show never competed with the Wizards or Capitals for regional attention but it didn’t have to. From the time NBA star Steve Francis lent his name to a 2007 show at the DC Armory, a show those in the arena can recall for a busted air conditioner that left some 5,000 fans nearly as sweaty as the fighters in the ring, Peterson fights in the DC area have shown a consistent ability to draw. If history holds to form, fans should get a good show. It could also be one of the last. At 4-3 in his last seven fights, with only two since 2015, there is always the chance Peterson is making his last home stand. Lipinets is a serious opponent. He gave Mikey Garcia a real go. Lipinets is also younger and with less professional miles on him. One wouldn’t expect to see Peterson face a soft touch on home turf. The 2007 appearance against veteran John Brown showed what was possible at the box office in the DC/Maryland/Virginia area. In 2011, Peterson got then-unified 140 lb. titlist Amir Khan, scoring a hotly debated upset in front of a very enthusiastic crowd. This will mark his fifth appearance in total, along with Khan, this decade. It represents half of his last ten fights. After Khan, fans also got feisty scraps with Kendall Holt and Dierry Jean in defense of the IBF 140 lb. belt. They also got a near defeat against Felix Diaz on the heels of a debatable loss in Brooklyn to Danny Garcia. Now they’ll get Lipinets in a classic crossroads contest. In an era without a ton of activity from anyone, that’s a pretty good stake in any market. In a broader sense, Peterson is the sort of fighter who late in his career deserves a little extra tip of the cap. A pro for fifteen years, Peterson was the sort of fighter who is just good enough to promise a good fight and just vulnerable enough that he didn’t have to be worried about getting ducked. In every era, there are fighters below the tippy top level whose names dot the resumes of more of their contemporaries than most. In the 1960s and 70s, there were men like heavyweight Jerry Quarry or welterweight Clyde Gray; in the 1990s, it was a Oba Carr; the sort of guys who win more than they lose, can beat anyone on the right night, and who almost always leave the fans satisfied as they head for the door. They are the sort of men who had depth to their time. In Peterson’s case, he went a step farther than men like that in winning a title and defending it. Looking back on the era, he’ll likely largely be regarded at about that level in comparison to some of the men who beat him and the even bigger names he never quite got a crack at. Boxing always needs its Lamont Peterson’s and the sport is better for having him. So was the area that made up his veritable home base. Whether this is a last big stand, or the beginning of an entertaining closing engagement, he’s certainly welcome home. The HBO documentary on Theranos is as watchable a piece of TV as there can be. It’s not boxing, but the one-time Network of Champions still knows how to score knockouts of another kind…Too much teeth gnashing on the whole Deontay Wilder to Showtime news. This is not the end of anything and one won’t be able to judge how good a decision this was, for fighter or fan, until a year or two from now. Once Fury went ESPN, Wilder was fighting Breazeale. Everyone knew that and now they know it won’t be on pay-per-view. Everything else is just to be determined…Is it time to start counting down to Srisaket Sor Rungvisai-Gallo Estrada II? It feels like it. Khan-Peterson II got cancelled after Peterson was found with synthetic testosterone in his system. He's a PED cheat but this article is still sucking him off. Awful. I think Lipinets stops him. Peterson is 35 and he really took a beating against Spence. I like the Oba Carr reference.......The whole article was better than usual.